T​he Little Mermaid II: Return to the Sea & Ariel's Beginning for the first time on Disney Blu-ray Combo Pack November 19th! One of Disney’s most beloved characters reveals the extraordinary events that led up to her transformation into a princess! Long before Ariel walked on land and into Prince Eric’s heart, she was one of seven beloved daughters of powerful King Triton. But times were troubled in the underwater kingdom – and music was banned! In this magical adventure, Ariel, her fun-loving sisters, and her loyal friends Sebastian and Flounder strive to bring music and friendship back to Atlantica. Featuring breathtaking animation – and some thrilling surprises – The Little Mermaid: Ariel’s Beginning is an enchanting tale you’ll share with your family again and again! 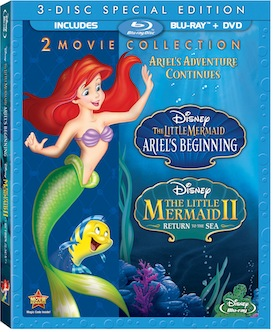 Deleted Song "Gonna Get My Wish"
We were so excited to get this 2 movie collection of the Little Mermaid!! I liked Ariel's beginning. It was fun to see Ariel bring music back to Atlantica. Everyone was so happy. When her mom died, the King banned music from his Kingdom. Ariel was able to soften his heart and the Kingdom was full of life again. I like Sebastian. He is so funny to watch when he gets stressed out! Flounder is pretty funny too. He is just a young fish that loves music so he swims around making sounds and enjoying every minute. The special features include: Deleted scenes, Backstage Disney, which I really enjoyed. I liked getting to see behind the scenes of the Little Mermaid Broadway play. That was pretty interesting. There are plenty more extras as well. The Little Mermaid II shows Ariel all grown up and raising a child named Melody. Ariel always told Melody that the sea is too dangerous and wouldn't let her play in it. Ursula's evil sister (Morgana) wants to have power and control over all the creatures of the sea. The only way she can do it is by stealing the Trident from King Triton. It's sad to see Melody get tricked by Morgana but in the end Melody helps her Grandfather, the King and they all live happily ever after. I loved the part in the beginning when Morgana's pet shark gets turned into a little fish. He spends the rest of the movie trying to get big again. It's pretty funny. There are some cool special features also. There is a deleted song, a DVD story book and make sure you check out the Animated short "Merbabies". My future Grandchildren are going to love both of these movies! One of my favorites and the gals. When we play in the tub, the kids like to sing that song "Under the Sea" and I just hum along.